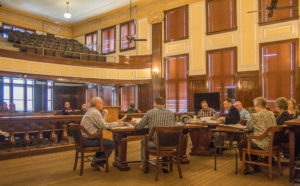 The Stephens County Commissioners took a major step forward in setting lower speed limits for some county roads when they voted at last week’s meeting to establish a county-wide speed limit on all county roads of 30 miles per hour. During the meeting, they also agreed to continue the burn ban and took action on several other items. 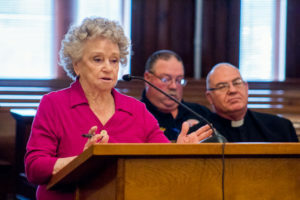 The commissioners held a public hearing at 9 a.m. Monday, March 11, to allow local residents to voice their opinions about the proposed speed limit change. Dr. Gary Fambro and Lisa Hodges signed up to speak. Fambro spoke first and said he lives on CR 146 East and has his veterinarian’s office on CR 225, and he is supportive of the plan to lower speed limits on some county roads. Hodges spoke next and said she lives on CR 274, expressed concerns about the speed limit being applied to stretches of the county roads that have few residents. Following the comments, the commissioners officially closed the hearing and returned to the regular meeting, at which time they discussed some of the specifics involved in changing the speed limit. Then, they voted unanimously to pass the ordinance. Although the commissioners voted to officially make the speed limit 30 mph on all county roads, the law is only enforceable in areas where there are speed limit signs. So, in reality, the speed limit will remain 60 mph on all county roads where there are no speed limit signs. The law applies only to official county roads, which are roads with the designation County Road or CR. The 30 mph speed limit does not apply to other city, state or U.S. streets, roads or highways. County Judge Michael Roach explained that the reason the county commissioners were passing the law to create the uniform speed limit, even though it is not enforceable without posted signs, is to avoid having to hold public hearings every time a county commissioner and his constituents decide speed needs to be limited on a specific stretch of a road. Roach said the default speed limit for all county roads has been 60 miles per hour and that some citizens have requested lower speed limits to make the roadways in front of their homes safer. However, he said, simply passing a new speed limit law doesn’t immediately solve the problem. He went on to explain that other rural counties have taken this same step to simplify the process of setting speed limits on certain county roads. By holding Monday’s public hearing and making the law apply to all county roads, all that will need to be done to actually lower the speed limit in an area will be to have a sign installed. Without the uniform speed limit law, every time a need was determined for a lower speed limit, another hearing would have been required. 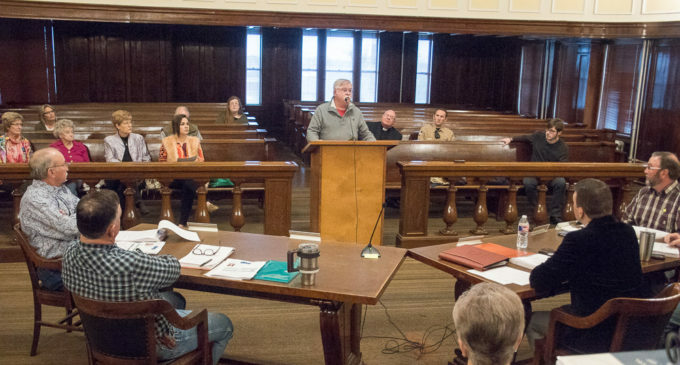 After Breckenridge Fire Chief and Stephens County Fire Marshal Calvin Chaney recommended keeping the current burn ban in place, the commissioners agreed not to change it. Chaney explained that although there has been some rain recently and there is rain in the forecast this week, the grass and other fuel will quickly dry out and can quickly catch on fire. There are some exceptions to the burn ban as outlined in the original order issued by Commissioners Court in Febrary, which includes firefighter training; public utility, natural gas pipeline or mining operations; planting or harvesting of agricultural crops; and burns that are conducted by a prescribed burn manager. Click here to see a copy of that order. The commissioners heard and accepted County Extension Agent Sumer Russell’s year-end report for the AgriLife Extension Office and Sheriff Will Holt’s 2018 Arrest Report. They also agreed to accept grant funds from the Leon Bosque Resource, Conservation and Development Council to host tire collection projects for Stephens County on April 27 and Oct. 5, and to accept a proposal to take part in a brush chipping project with the City of Breckenridge on March 25-29.
the handbook dealt with definitions for “full-time” and “part-time” employees, methods of announcing job openings, employee vacation days, sick days and health insurance premiums. 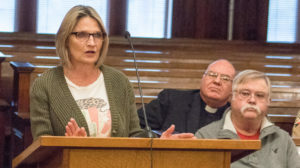 Additionally, Jean Curtis, spoke during the public comments section of the meeting, praising the local jail. 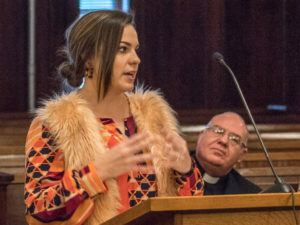 She volunteers to host a Bible study for the women who are in the Stephens County Jail.